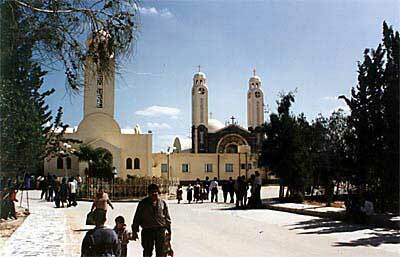 Welcome to St. Mina Monastery in Mariut on the Web! This site is about St. Mina (Menas) Coptic Orthodox Monastery in Mariut, near Alexandria, Egypt (Deir Mar Mina in Arabic), its history, and its famous saints and their miracles. Using the Navigation Buttons on the left, you can browse the content of this site, including some rare video clips and many photos and icons. You can always return easily to this page (Home). There is also a hierarchical listing of all the pages in this site (Site Map). Others were tortured, not accepting deliverance, that they might obtain a better resurrection. Still others had trial of mockings and scourgings, yes, and of chains and imprisonment. They were stoned, they were sawn in two, were tempted, were slain with the sword. They wandered about in sheepskins and goatskins, being destitute, afflicted, tormented--of whom the world was not worthy. But now the LORD says: "Far be it from Me; for those who honour Me I will honour, and those who despise Me shall be lightly esteemed." God declared the greatness of this saint through the blessings from his relics and countless miracles at Mariut, Egypt. Several churches were built in his name, in that area, the largest of which was the great Cathedral (Basilica) built with seven altars by the Roman emperor Arcadius. He built it with marble and precious stones, and along with the other churches in the area, it attracted many pilgrims who visited the site to receive the blessings of St. Mina. The area turned into a city with homes, mansions, factories, markets and much more. This shows us the saint's rank among Church saints. Time passed and the area along with its churches faced tribulations, then destruction. Saint Mina's relics were moved from city to city in threat of being lost, but God has preserved this saint's relics from many dangers that have never come collectively across any other saint's relics; St. Mina's relics have been thrown into fire and did not burn, but instead shone a bright light. 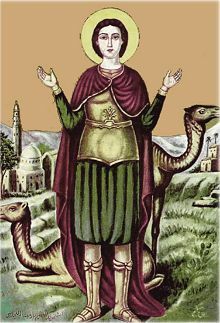 Every time these relics were lost or moved to another place, God would show that they are the relics of his beloved soldier, the martyr St. Mina. Therefore, there is no doubt that it was God who guided the late Pope Kyrillos (Cyril) VI to revive the glorious memory of this magnificent saint, and to bring back life to that land (Mariut) which St. Mina had once filled with life and miracles. What Pope Cyril did was a noble accomplishment, which was itself a miracle (more than anything) that God used to keep this saint's memory alive. St. Mina's memory was brought back in an extraordinary way that has left a flame burning in many people's hearts, until this very day. The Pope's relationship with St. Mina goes back to the years of his childhood. When he was ordained a monk, it was God's will that Anba Youaness ordained him with the name Mina, in the Baramos monastery. He became closer to St. Mina, by using him as an example and praying for his intercession. When he was forced to leave the windmill, he built a church in the saint's name in Old Cairo; but that was not enough to quench his fire of love for this saint. He kept sending requests for permission from the agency of Archaeology to live in the lower room of St. Mina's ancient church in Mariut (Abu Mena). His wait for an answer was prolonged, but he remained persistent until he received the approval, after the altar lot had announced him to be the new Patriarch of the See of St. Mark. This was a sign from heaven that the Pope understood: that he would not live in a room, which he remained persistent in getting, but instead he would liven up the whole area after becoming Pope of Alexandria. Visitors to the Abu Mena region used to look at it with sad heart, for the destruction that came about it. Today, they can look at it from a joyful angle for the glorious works that Pope Cyril has accomplished, in an area that was deserted for centuries. He covered it with his faith and gave it his building spirit. This gave the land the heart beat of life and raised the voice of praises within it once again. Its old owner, the Martyr St. Mina, returned to his land, dressing it once more with the attire of peace. The Pope was never discouraged, from work, by the hardship of the way, his old age, the danger of the place, the difficulty of bringing water or building tools to it, and thus many miracles were manifested on his hands. The Pope sent to the agency of "desert development" with a request to purchase 50 acres next to the ancient city in Mariut and then another request for 50 more. In 1959, on the first feast for St. Mina after the Pope's ordination a large festival tent was put up. The Pope sent his secretary to pray evening raising of incense and ensure that everything was ready for the feast's Holy Liturgy in the morning. In the morning, his holiness prayed the hymns and the Holy Liturgy. Those who received Holy Communion that morning were about 500 men and women. He then went to the land, which he had bought from the agency of desert development. He prayed, blessed it and placed the cornerstone of St. Mina's monastery. During the feast, the Pope was asked by some of those who were present to sit in the large chair prepared for him but he refused saying: "This chair is for St. Mina". The two Alexandrian contractors, Sharobeem and Farag Akladious, built a small church, two rooms for his holiness and another for making the holy host. The Pope and those accompanying him spent months in these two rooms with no safety nor rest, just to ensure that the work is being completed. The Agency of Archaeology agreed to the transport of bricks, that had no archaeological value, to use in the building of the monastery. The students used tractors to transport these stones; it took two full years, and a brick wall was built around about fifteen acres from the monastery's land. Some monk cells were built along with another church, which was blessed in a large celebration attended by thousands of people. Pope Kyrillos' yearning for St. Mina's ancient church pushed him to ride a donkey to the ancient church to receive the blessing of St. Mina's land. The ancient church or Basilica of Abu Mena with its seven altars was taking Pope Cyril's mind, so he planned to build something similar to liven up the memory of his beloved hero, who was once visited in this same land by people from all corners of the Earth and all walks of life seeking his prayers and intercession. The area occupied by the new St. Mina Cathedral in Mariut is more than that of the old St. Mark Cathedral in Cairo. Before his departure in the Lord, Pope Cyril left 55,000 Egyptian pounds for the completion of this cathedral to suit the glory of that heroic martyr, St. Mina. Countless miracles occurred and continue to occur everyday through the intercessions of St. Mina the Martyr, Pope St. Kyrillos VI and the late Abba Mina Ava-Mina. Front view of St. Mina Monastery in Mariut showing the church of St. Mary and St. Mina (front left) and the new Cathedral with its two towers (on the right in the back). A small chapel to the left of the church of St. Mary and St. Mina (and connected to it with a short corridor - this chapel is not shown in this photo) previously had the shrine and relics of St. Mina. These are now located in the new Cathedral of St. Mina, which was inaugurated in January 2005.